Residents in neighborhoods across a district in Ho Chi Minh City have been voluntarily contributing parts of their valuable land to help widen local alleys, helping build a better community, and ultimately a better life for themselves. 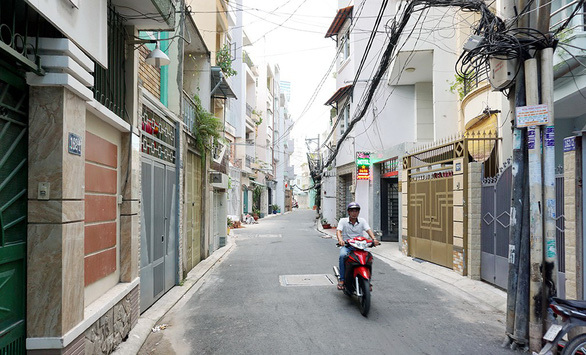 Multiple narrow alleys across Phu Nhuan District have disappeared over the past years and are now replaced by much more spacious passageways that even automobiles can enter. The cooperation of local residents played a vital role in the expansion of these alleys, as they agreed to turn a part of their private property into public space. “The alleyway is wider now. It looks great. If it needs to be further enlarged, I am willing to contribute another part of my land,” said Le Doan Minh, 71, who lives in an alley at 19 Co Bac Street. The passage was only six meters wide about six decades ago, Minh stated, adding that people moved here and started building their houses, narrowing the width of the alley to only three meters. About five months ago, all people living in the alley consented to give up part of their homes to create a 4.5-meter-wide passage. Local authorities took care of the construction, which was funded by the budget of the ward where the alley is located. “As there is more space, more people will travel by, which will certainly benefit my business,” said Nguyen Thi Lien, who runs a small grocery shop at her home down the alley. Meanwhile, Nguyen Thi Kim Chi, another resident, expressed her relief that ambulances and fire engines can now fit into the alley. “My younger sister had a stroke two years ago and the ambulance could only stop at the entrance of the alleyway. I had to ask other men to carry her out but it was too late,” Chi recalled. Along the alley at 162 Phan Dang Luu Street in Ward 3, about 60 families have also offered some of their land for the expansion, according to the local administration. The pathway was previously one meter wide and could only fit one motorbike at a time. “It is all for the greater good,” said Pham Duc Chinh, who previously handed over 20 square meters of his yard. 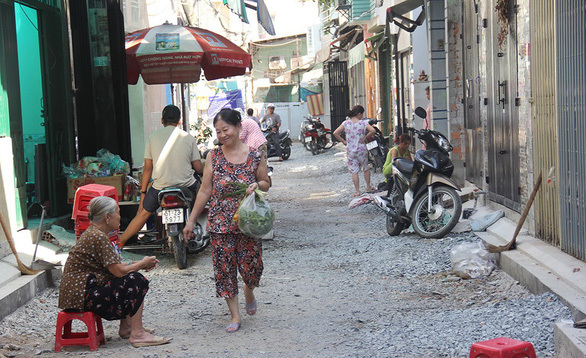 Four other alleys in Ward 3, Phu Nhuan District, have also been widened over the past two years, with local residents having given up more than 1,300 square meters of land, which is worth tens of billions of dong (VND10 billion = US$428,535), said Huynh Van Vu, chairman of the ward’s administration.